"Nearly all men can stand the test of adversity, but if you really want to test a man's character, give him power"
The guys that brought us Burnout Paradise ? WTF! This will be the best NFS EVER! GOO CRITERION! Sana may super moments din na parang burnout!! We're not sure what type of Need for Speed Criterion is creating, but we wouldn't be surprised if it was heavy on the crashing. dualshock wrote: WTF! This will be the best NFS EVER! GOO CRITERION! Sana may super moments din na parang burnout!! EA naman publisher ng criterion. EA din nagpublish ng burnout paradise ng criterion kaya walang dapat ikabahala basta criterion ang magdevelop ng game. NFS will be shown for the first time today at internal Electronic Arts meeting! Let's put the pedal to the metal and hit it....! I don't get the negativity towards EA now. They've changed for the better, as far as I'm concerned. They've been churning out really good games last year and it continues to this year thanks to Mass Effect 2. If there's a company to hate right now, it's gotta be Activision. Need For Speed + Burnout = Oh. My. God. If ever Split/Second turns out to be a flop, I'm surely gonna wait for this game instead. The Gameplay vids you're seeing now are probably just unfinished prototypes. Think of it as the first demo of MotorStorm: Pacific Rift or the Shift demo: They're very different from the full game. Split/Second still has a pretty long way to go with May as its announced release date. basta lagyan lang ng physics yung auto,.. i find dirt 2, and grid great racing games not only because of its challenging courses and the handling of the cars pati narin yung physics sa auto... anyway OT na pala..
Is "Need For Speed: Hot Pursuit" Criterion's 2010 NFS Title? Nestled comfortably in the middle of the "One to Watch" category of the Future Publishing run Golden Joystick Awards is a title that may have slipped through the net. A title that has yet to be officially announced. I am of course talking about EA's upcoming 2010 Need For Speed title, but with a title that seems to suggest that developers Criterion are almost certainly returning to the franchise's roots for its upcoming sequel. We already know that Criterion is working on the 2010 version of the franchise thanks to an admission from EA Games Label President, Frank Gibeau, and the odd "cryptic" tweet from Criterion. The Golden Joystick listed Need For Speed: Hot Pursuit suggests the franchise is set to get the reboot that it needed 5 years ago. Better late than never I suppose. This would fall in line with the Creative Director, Alex Ward's recent - and now deleted tweet that stated, "Red lining it all the way and making it pay" - a return to the original 3DO version of The Need for Speed." It seems that evidence is mounting for a return to the old skool for the Need For Speed franchise. News that makes us supremely happy. Anyone care to place a wager on an E3 unveiling? New racing title slotted for November. 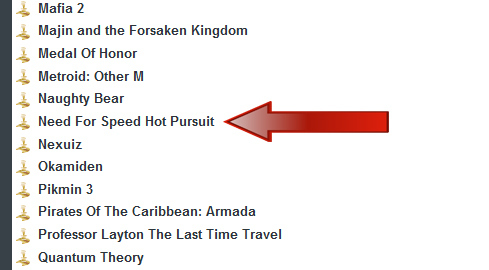 During Electronic Arts' E3 2010 press conference, the company announced Need For Speed: Hot Pursuit, the latest racing title in the long-standing franchise. The game is being developed by UK-based Criterion Games, makers of the Burnout series. Need for Speed: Hot Pursuit will launch on November 16, 2010 in North America and on November 18 and 19, 2010 in Europe for Xbox 360 and PlayStation 3. The game will also be released for Wii, but development is being handled by Exient, another UK developer that previously worked on handheld ports of the FIFA and Madden franchises. 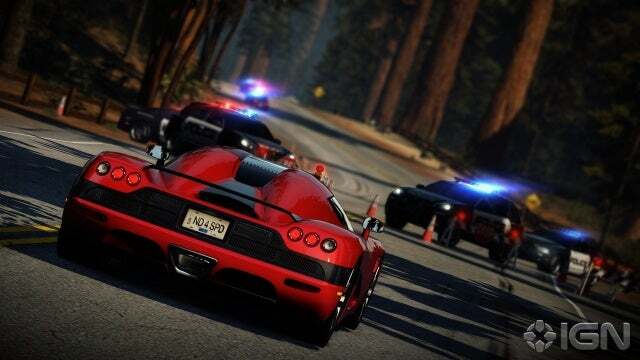 A gameplay demo showed that Criterion would be staying faithful to the Hot Pursuit formula, with supercars playing high-powered cops and robbers. A brief two player gameplay demo showed a pursuit in action as two Lamborghini Murcielagos went toe to toe through some tree-lined roads. Online will play a large part, with a feature called the Autolog providing a feed of friends in-game achievements. "At Criterion, we've been playing Need for Speed since it was first introduced on 3DO. We are honored and excited by the opportunity to reinvent the franchise for today's connected audience. Our goal has been to create cops vs. racers pursuits that are so fun, fast and exciting it really brings to life the adrenaline and intensity of the high speed cop pursuit experience with your friends." We'll be bringing you a full preview of the game once we get our eyes on it at the show tomorrow. Last edited by gabe on Tue Nov 16, 2010 6:53 pm, edited 5 times in total. ang lupit ng trailer!! added na ito sa most anticipated games ko!! sana di ako madisappoint.